2017 Husqvarna 701 Vitpilen spotted | IAMABIKER - Everything Motorcycle! A test prototype of the new 2017 Husqvarna 701 Vitpilen (Vit = white, pilen = arrow) that is soon to be released has been spotted testing on the road. The Husqvarna 701 Vitpilen is a café racer that started life as a concept way back in 2014 that Husqvarna will put into production to bolster their road going line-up. The 2017 Husqvarna 701 Vitpilen is based on the KTM 690 Duke and will share a lot of components with the feisty naked, such as the steel trellis frame, inverted front forks and rear shock that are WP units, alloy wheels and the punchy 690cc single-cylinder engine that is liquid cooled and makes about 73 HP. 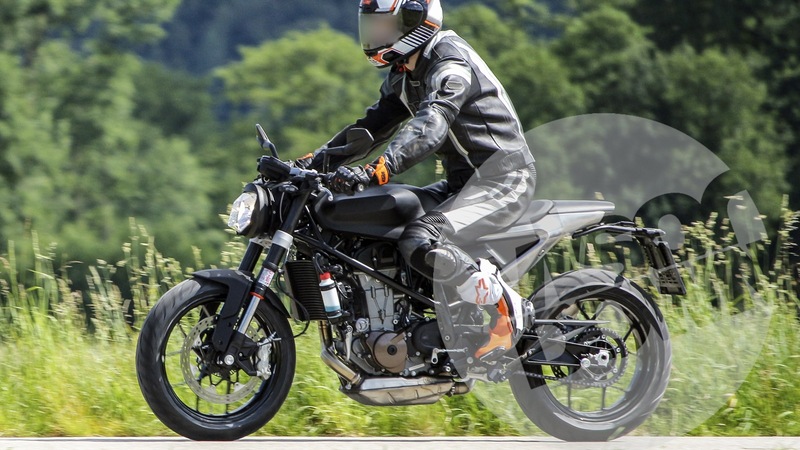 The 701 Vitpilen test bike also had the swing-arm and underbelly exhaust from the 690 Duke. The standard upright position of the KTM 690 Duke has been replaced with a more aggressive and forward biased position. It is very interesting that the 701 Vitpilen has been designed to be a retro-modern café racer. This is keeping with the trend of the retro-modern and modern-classic designs that are flooding the market today. KTM’s typically edgy and sharp design has been worked over to be a little more free flowing. The bars are a little lower than the Duke 690. The seat is narrow and long, with thin padding. The fuel tank has been flared rather heavily, with cut outs on the sides of the tank to help the rider securely lock onto the bike. The tires have an aggressive rounded profile and should help the rider stick to the tarmac in all lean angles. ABS should be standard on the bike, with a four piston caliper up front and a single piston caliper at the rear. A fully digital console is also likely to be present on the Vitpilen 701. A LED tail light and LED front lighting will reflect the modern touches on the bike. The finished 2017 Husqvarna 701 Vitpilen will probably be showcased at the Intermot or the EICMA this year and will be launched in 2017 for European and possibly international markets as well. It will surely be priced at a premium above the existing KTM Duke 690. A 125cc version and a 390cc version of the Vitpilen is also in the works. This line-up will complement the Svartplien line-up which will be more scrambler oriented with knobby tires and the likes. Husqvarna could be onto something with these two series of bikes.